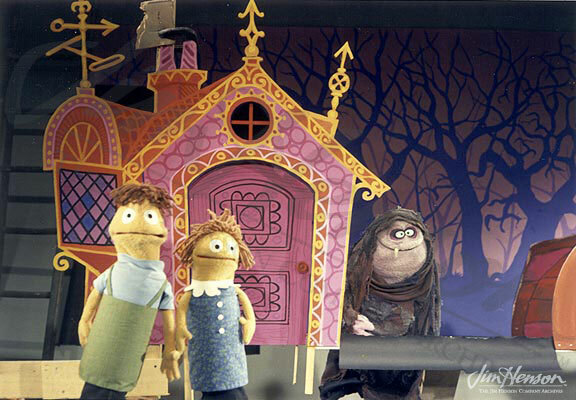 Jim and Jerry Juhl tried several uses for the fairytale puppets originally created for The Tales Of The Tinkerdee pilot. In particular, Jerry had great affection for his Taminella Grinderfall witch character, the only one that he alone voiced. While she had been dressed as a man and used in a few commercials, her true witchy-ness had not been on display on the air. In early 1965, Muppets Inc. was hired by the Mogul Williams Saylor advertising agency in New York to make three commercials for the Compax Corporation’s product Pak-Nit RX, a revolutionary knit fabric that would neither shrink nor stretch when put in the dryer. Ruth Branchor, the agency’s copy writer, had the idea to parody fairytales for the spots, and Jim and Jerry Juhl had just the characters for the job. At last, Taminella got her starring role as the witch in a send-up of Hansel and Gretel. In the service of the Compax Corporation, the children were called Shrinkel and Stretchel, and encountered Taminella in her forest home designed and painted by Jim. After being pushed in the oven by Taminella, Shrinkel and Stretchel emerged as good as new, revealing their true identity as the Pak-Nit RX twins who could withstand the heat of a dryer (or in this case, the witch’s oven). A second commercial, “Rumple Wrinkle Shrinkel Stretchelstiltzkin”, also relied on a familiarity with fairy tales to make the joke and provided work for a favorite of Jim’s, King Goshposh, working under the assumed name of King Impossible the Third. 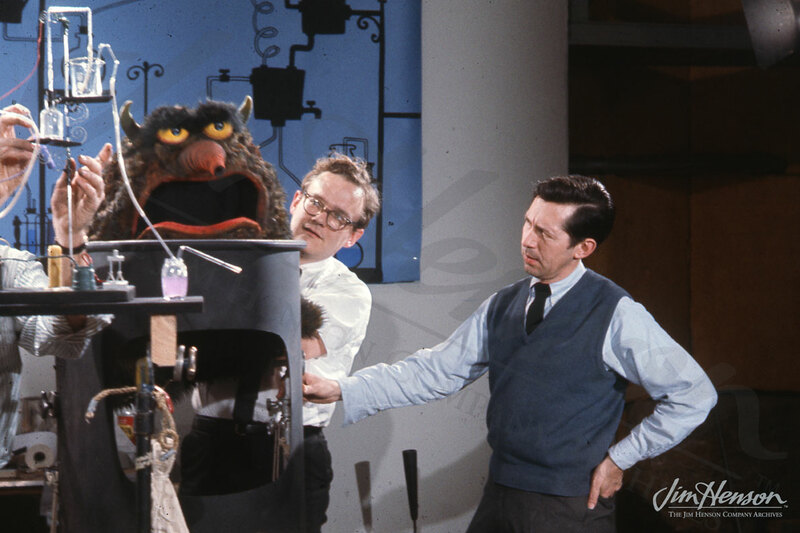 The last commercial “Shrinkenstein” played off of Mary Shelley’s Frankenstein and was a vehicle for Big V, the monster who routinely ate Kermit on various variety shows. See Taminella in action with Shrinkel and Stretchel. 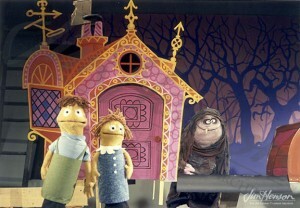 Shrinkel, Stretchel, and Taminella on the Pak-Nit RX set created by Jim, 1965. Opening storyboard panel for “Shrinkenstein” drawn by Jim, 1965. Opening storyboard panel for “Rumple Wrinkle Shrinkel Stretchelstiltzkin” drawn by Jim, 1965. 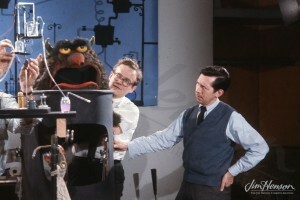 Jerry Juhl and Don Sahlin (and Big V) on the set of “Shrinkenstein”, 1965. This entry was posted in 04-April '65, 1965, Commercials and tagged Compax Corporation, Jerry Juhl, Mogul Williams Saylor, Pak-Nit RX, Rumple Wrinkle Shrinkel Stretchelstiltzkin, Ruth Branchor, Shrinkel and Stretchel, Shrinkenstein, Taminella Grinderfall. Bookmark the permalink.